Day 8 of Kidding Around was called "5 Favorite Things to Do on a Hot Summer Day." The assignment was to write each item on a tag, then attach the tags to the journal. There are six videos to watch during the course of the class and one of them covers all the various ways to attach things, like stapling, gluing, taping, using paper clips, etc. One product Tami demonstrated was washi tape. Trevor was smitten. I hadn't realized I'd never used washi tape with him. He was giddy to see how many different rolls I had and couldn't wait to use it on his page. Trevor's five things he likes to do during a hot summer day are: running through the sprinklers; going in the spa; playing Monopoly; doing Legos; and playing computer games. The five things I love doing on a hot summer's day are: having a BBQ and playing games with friends; sitting in the shade with a good book; spending all day inside crafting or scrapbooking; making and eating homemade ice cream; and spending the day at the county fair (and eating at least one shave ice). 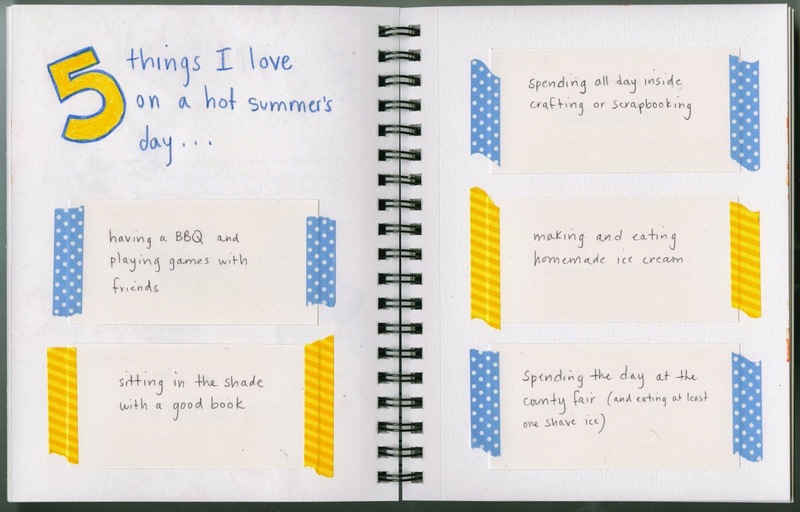 What are your top five ways to spend a hot summer's day? He rocked the washi tape!! LOVEEEEEEEEEEE it!!! 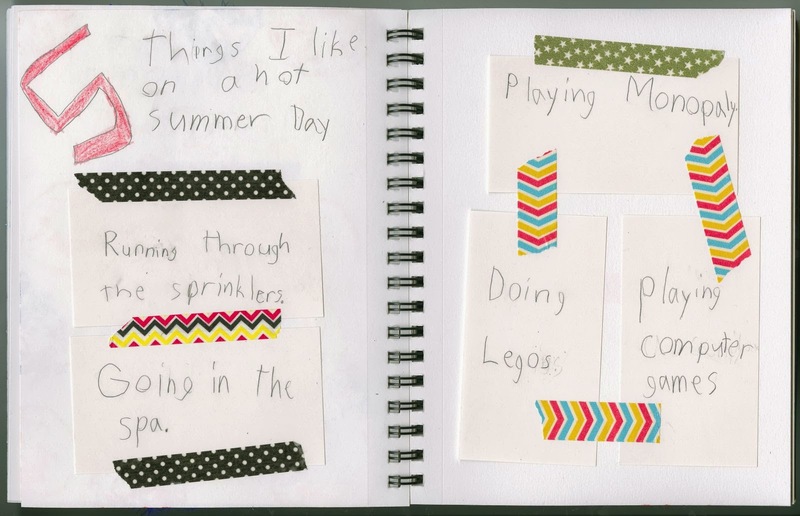 I love how both of your pages turned out - they really show your creativity! 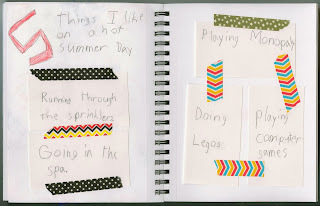 I also liked reading about your 5 favorite things to do an a hot summer day. You had me at washi tape! How fun!